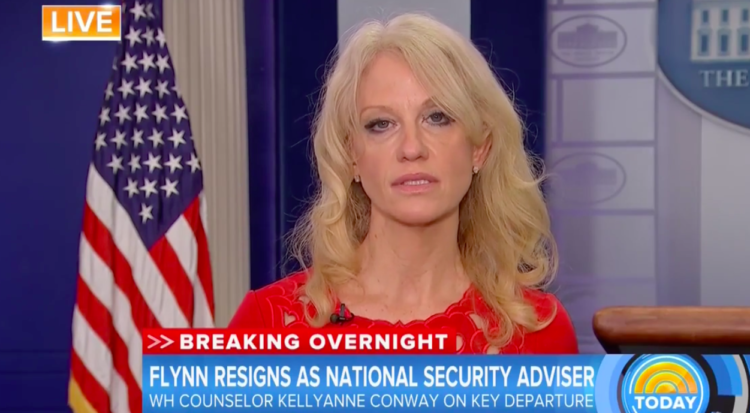 For years, you’ve worked the pundit circuit like a pro, and you’ve parlayed what you’ve learned into defending an incompetent puppet with really bad hair. You are the Queen of Spin. I’ve never seen anything like it. Someone — anyone — can point out the obvious, and you’ll pivot and dispute it with a sense of calm that rivals Mister Rogers. If you’re told the sky is blue when the sky is demonstrably blue, you’ll say the sky is green because Hillary’s emails put the children of the world in more danger than nuclear detonations, and it’s not fair that we talk about the color of the sky because Donald Trump loves women and Fudgsicles — and you’ll say it all with that trademark serene smile on your lifeless face. For a while the press allowed you to spin, pivot, and repeat with little or no attempt to hold you accountable. Things have changed a bit, haven’t they, Kellyanne? Your lies are now being called what they are: lies. Not alternative facts. Lies. The press is finally holding you accountable and you’re starting to crack. Your downward spiral is obvious to anyone paying attention. Since the embarrassingly low turnout on Inauguration Day, you’ve been on overdrive defending the indefensible, and it’s showing on your face. You look exhausted and your eyes are dead. Not as dead as Stephen Miller’s lifeless eyes, but close. We The People can literally see the life in you drain away as you robotically lie for Trump over and over and over. Watching your fast-track breakdown is almost as exhausting as it must be to actually be you. There’s a high price to pay for dishonest behavior and it’s mostly internal. Even if you’ve convinced yourself that your lies are justifiable, and even if you’re able to keep your job with no legal consequences for your endless stream of “alternative facts,” the steep toll of your deceit has a negative, lasting effect on your physical health. Studies have been conducted. We know some things about how the body reacts when one lies. Since the lies you tell are so blatant, bold, and told to a massive audience — the world — you’re most likely harming yourself and, in the process, decreasing your life-span. According to a 2012 article in USA Today, “Each week for 10 weeks, 110 individuals, ages 18-71, took a lie detector test and completed health and relationship measures assessing the number of major and minor lies they told that week, says lead author Anita Kelly, a psychology professor at the University of Notre Dame in Indiana. She presented findings at the annual meeting of the American Psychological Association. Lying is stressful, and long-term exposure to stress can lead to serious health problems. Your denial of reality and your chronic misrepresentation of the truth could lead to your early demise. This isn’t an “alternative fact” Kellyanne, this is science. You’re a mother. This should concern you. I imagine if you and I were in the same room and I was able to relay this information in person, you’d look at me with your dead eyes and explain in your subtle, but evident, South Jersey accent that your alternative version of the truth is perfectly acceptable because Bill Clinton is a cad, Michelle Obama’s arms created turmoil in the Middle East, and Trump will build a wall of burritos in Manhattan, and he’ll make the Chinese government pay for it with fortune cookies and bok choy. You can threaten me and tell me that, as a blogger, I’d better watch my back because I dared to call you out for the bold-faced liar you are, but it doesn’t change the FACT that your lies are slowly destroying your health, and your alternative facts are putting the entire world at risk — a world your children will inherit. And for what? A hefty paycheck? An office in the White House?